Pawn History is rich with mysteries even when “pawnbroking" actually started. The fact its the oldest financial institution know to mankind. In China, pawnbroking was traced back over 3000 years ago, and it also exist in ancients Rome and Greece. In European Middle ages when pawnbroking was established and founded came our modern day Pawn Shops. As everyone knows during the Middle Age in Europe they had another name know as the Dark Ages. When the financial uncertainty and economic depressions had spread around the land. At the time the primary money lenders were two families, the Medicis of Florence and the Lombard family from England. 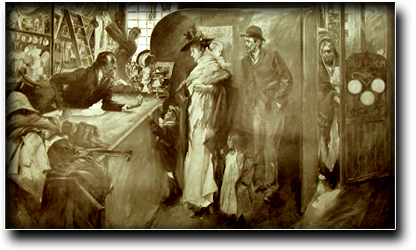 Lombard’s family had many pawnshops during that time, and they were the first registered money lenders in England. The worldwide symbol of the pawnbrokers is the three balls that were adapted from Medicis Family of Florence’s crest. The most famous pawn that happened in the middle ages was that Queen Isabella of Spain had pawned her crown jewels to finance Columbus’ voyage to America. Imagine, if we did not have Pawnbrokers at that time; how different the American history would be. In 1700s-1800s that is when the pawnbrokers got a bad name. Pawnbroking did not have any regulation and the interest rate was high. The Pawnbrokers Act of 1872 had helped to regulate the pawnbroker. During World War II, there were 5000 pawn shops in British Islands and Ireland making loans against anything from clothing to diamonds. A busy pawnbroker could serve over 500 customers in a day. In 1970s, there were less than 50 pawn companies in the country. The high bank rates of the time left the pawnbrokers with only a 2-3% annual return on their major loans, making it hard to make money. The Consumer Credit Act of 1974 had helped the pawnbrokers and customers alike by restricting laws and removing unnecessary laws. This act had helped to increase the pawnbrokers in numbers, and return an ancient profession back to its glory. Many people believe that pawn shops are an evil industry, funding terrorist, thieves, and drug user, and most of their products are stolen. This is far away from the truth; the pawnbrokers is one of the most regulated profession in the country. Pawnbrokers comply with all federal, state and local regulations and laws. In most jurisdictions, they provide local law enforcement with data on all transactions on a daily basis. There are more than 50 million honest hard working Americans who don’t have bank accounts or credit cards. Those people only can get loans and money from their local pawn shop. With help from pawnbrokers, many people can pay for their electricity, rent, and gas for the cars.